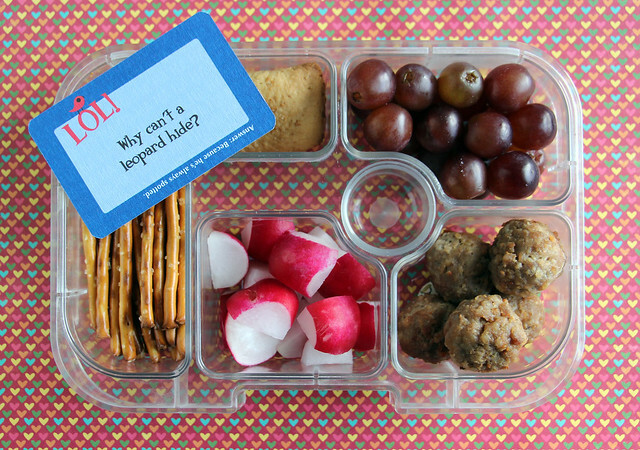 On Monday, Wyatt had a cereal bar, grapes, mini-meatballs, radishes, and pretzels. I also included a Lunchbox Love joke card with a note on the back (we had a bad morning). This was packed in our Yumbox. 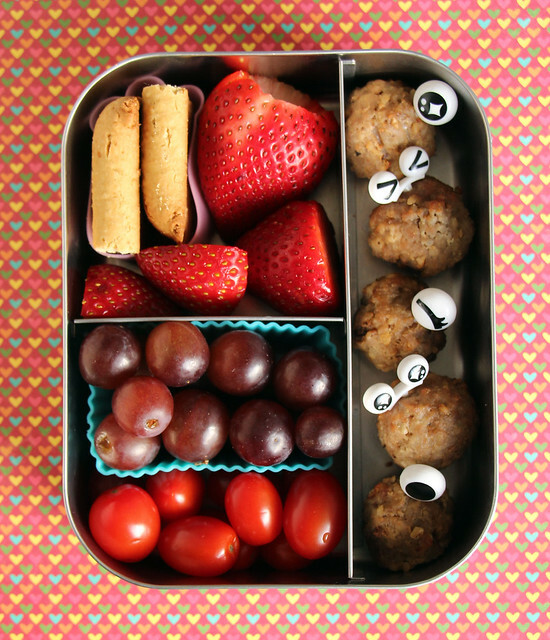 I packed Augie’s lunch in our LunchBots Trio: a cereal bar, strawberries, grapes, tomatoes and mini-meatballs with eye picks stuck in them. Tuesday was April Fools, so I had to do something a little silly in Wyatt’s lunch. 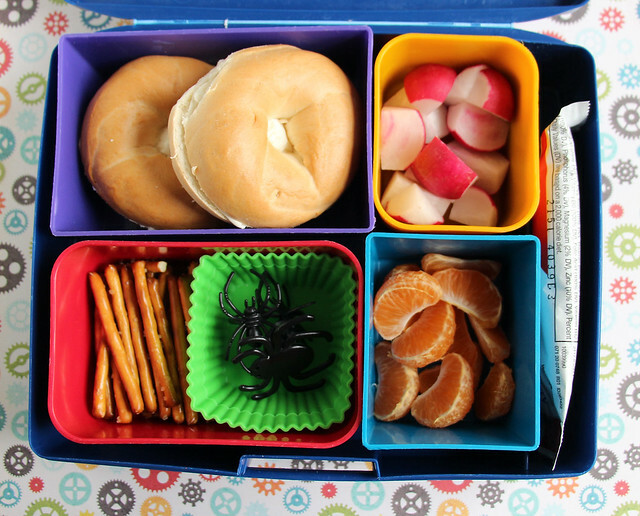 I mostly packed a normal lunch — bagels with cream cheese, radishes, pretzel and oranges, but I also included a little cup of plastic spider rings. This was all packed into a Laptop Lunches box. I also played a little trick, by carefully cutting open a cereal bar, pulling it out, filling the wrapper with shredded carrots and taping it shut. This worked really well and Wyatt couldn’t stop talking about what a good joke it was. Score! 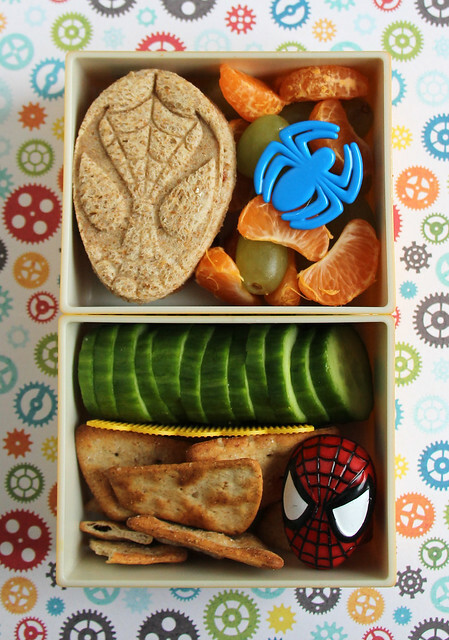 Augie was not interested in April Fool’s jokes, so I made him a Spiderman lunch instead. He had two Spiderman peanut butter and jelly sandwiches, grapes, clementine wedges, cucumber slices and pita chips. I also included a couple Spiderman rings for decoration. This was packed in my little house bento box. 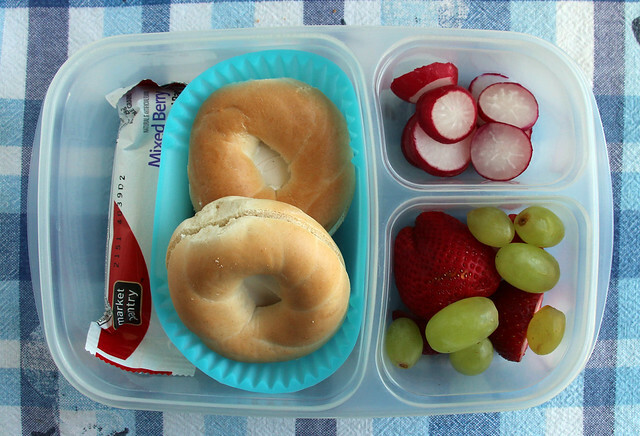 On Wednesday, I packed Wyatt a real cereal bar, bagels and cream cheese, radishes, strawberries and grapes. I put it all in an EasyLunchboxes container. 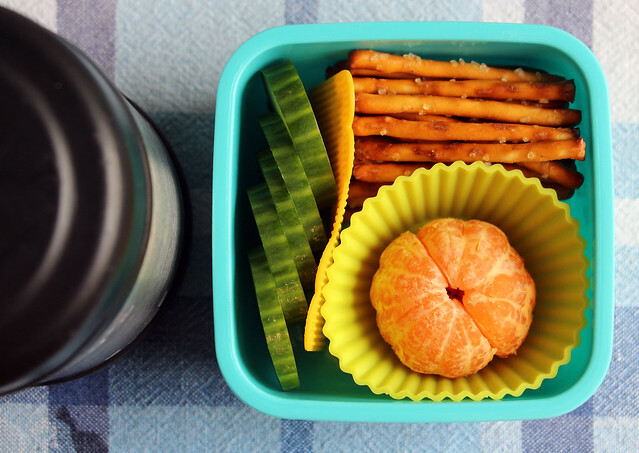 I used an EasyLunchboxes container for Augie’s lunch too. 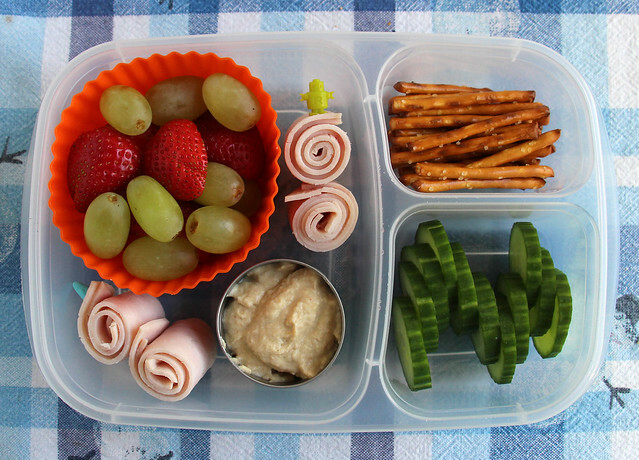 He had strawberries, grapes, turkey spirals, hummus, pretzels, and cucumber slices. On Thursday, the boys both took leftover pasta in thermal jars. Wyatt had a sidecar with a clementine and some pretzels. 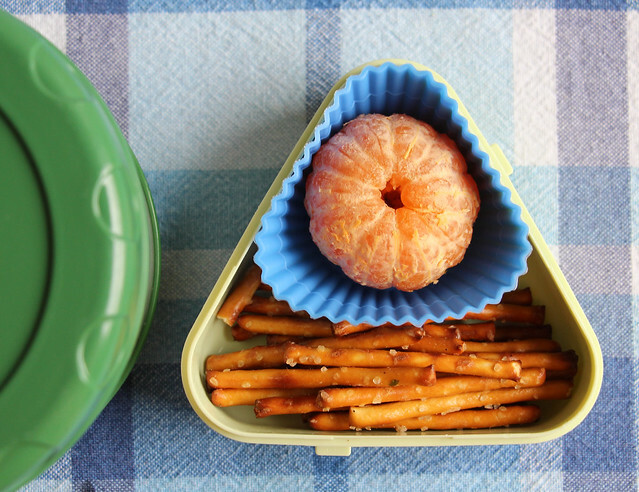 Augie’s sidecare had cucumbers, pretzels and a clementine. 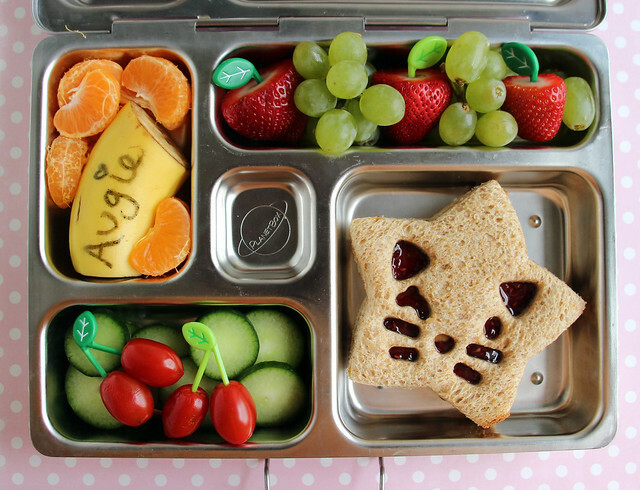 On Friday, I packed Augie a lunch in the PlanetBox: clementines, a half banana with his name written on it with food-safe marker , strawberries with leaf picks, grapes, cucumber slices, tomatoes made to look like cherries with more leaf picks, and a kitty star sandwich. The face on the sandwich was cut using the Cutezcute Animal Friends cutter. This is my favorite lunch I’ve made in a really long time! Wyatt had a school lunch. We are off on spring break this week! See you in a few!